The HSE was accused of having ‘hidden waiting lists’ today. THE HEALTH MINISTER has said that a “row over statistics misses the point”, after it emerged that tens of thousands of patients were omitted from official HSE waiting list figures. The details were published in the Sunday Business Post today. The newspaper says that numbers related to some patients waiting for diagnostic tests are not incorporated into national waiting list figures published by the HSE. The figures were given to Deputy Billy Kelleher in answer to a parliamentary question. The Health Minister released a statement saying that the information provided to Deputy Kelleher was given to him by the HSE on foot of a request from the Health Department. Clearly, there was no attempt to conceal this information. The HSE provided it. As Minister for Health, I have to argue for more resources for our health service. I have no interest in making things looks any better or worse than they really are. 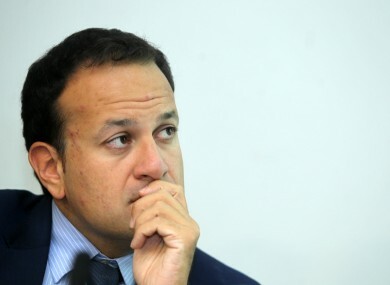 “The HSE plans to publish information on waiting times for diagnostics again in the future but it is important the information is accurate and comparable across hospitals, as currently it is not,” continued Varadkar. It’s also important to bear in mind that many people waiting for a scan are also waiting for a hospital appointment or surgical procedure. Rather than under-estimating the number of people waiting, it’s often the case that the same people are often counted several times. A row over statistics misses the point, in my view. We all agree that waiting times for public patients are unacceptable. I am working with the HSE on plans for next year for a special focus on very long-waiters. The Health Minister said that long waiting times for public patients “have been a feature of our health service since the 1980s”. Deputy Kelleher said that the figures he received from the HSE outlining waiting times for MRI scans “make for frightening reading”. 27,000 people are currently on a list for a scan, and there are major backlogs at St. Vincent’s University Hospital and the Mater in Dublin, with patients waiting more than a year for the test. The situation has reached critical levels at the Mid-Western Regional Hospital in Limerick where there are 2,000 waiting more than 2 years. He said that he was concerned the health service was becoming “more secretive and less transparent”. Sinn Féin TD and spokesperson on health, Caoimhghin Ó Caoláin said that the HSE Director General needs to “immediately come clean” on the revelations. Email “Varadkar: There was "no attempt to conceal" waiting list numbers”. Feedback on “Varadkar: There was "no attempt to conceal" waiting list numbers”.